One of the primary obstacles that often prevent renter households from becoming homeowners is lack of financial resources (upfront capital) to cover the down payment and closing costs associated with home purchase. With this in mind, many affordable mortgage programs include some form of downpayment and/or closing cost assistance to help offset the burden to the prospective homebuyer, who would otherwise quality for mortgage financing. These "downpayment assistance" programs take various forms, from grants, to forgivable non-amortizing loans, to low interest rate second mortgages. A concern associated with downpayment assistance programs is that homebuyers who require such assistance to purchase a home may not have the financial resources to sustain homeownership when faced with unexpected costs of being a homeowner, or, that because they have less invested up front, such homebuyers may be more likely to walk away from their property if they face financial hardship. In either case, an expected outcome might be increased mortgage delinquency and foreclosure for homebuyers receiving such assistance. 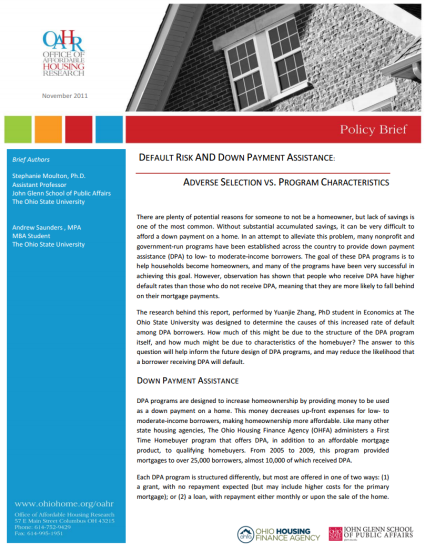 This research project evaluates the loan performance of low and moderate income homebuyers receiving different forms of downpayment assistance in OHFA's First Time Homebuyer Program, to identify factors that are more or less likely to lead to poor loan performance for borrowers receiving downpayment assistance.